Steinberg Studio Case II: Status: just announced. US$299, Windows/Mac September, watered-down versions of everything Steinberg makes. For entry level users, this could be a decent deal: Reason, by comparison, costs $450 and has a lousy sequencer and no audio recording. Ableton Live costs around $400 and doesn’t have as many instruments. But there’s nothing here to write home about: stripped-down versions of everything? Spend the extra couple of hundred bucks and get what you really need. HALion String Edition: Status: just started shipping. This one appeals a little more to the snob in me: 9 GB, nothing but strings. Haven’t heard it yet, but it sounds like it could be first-rate. Of course, you’ll be missing several sections of the orchestra, but . . . wait . . . that’s kind of a problem, isn’t it? Then again, strings are usually the hardest to sample, so if you need some violins to supplement your existing sample library, maybe this is for you. The Grand 2: Status: shipped in July. I missed this because I was busy with Native’s new product, Akoustik Piano. 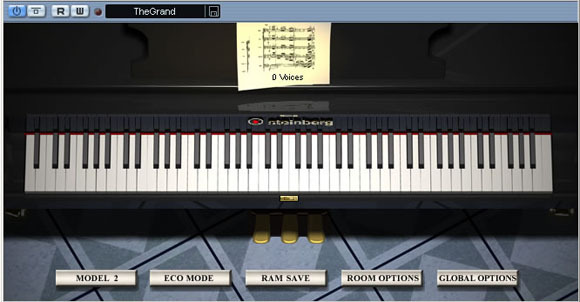 The Grand has a strong reputation, but also a lot of competition: aside from Native’s virtual piano, there’s the renowned PMI libraries, cheap offerings from M-Audio, Ivory, and basically a zillion sampled pianos everywhere from Logic to Kontakt to MOTU Mach Five. What’s cool here: key click, pedal and hammer sounds and four-channel surround implementation. Upgrades are just US$99, and the whole thing runs US$299, so it’s bargain priced, and unlike some Steinberg products, it supports VST, DXi and AU (though Digi fans, you’re stuck with ReWire — no TDM/RTAS). Only time will tell: I want to get The Grand and Akoustik Piano and others together and see which sounds best. Studio Case II: Diet Steinberg? Ho-hum. HALion String Edition: Why not a full orchestral edition? The Grand 2: Verdict reserved until the Akoustik Piano shootout.